Great news for those who use LinkedIn to look for potential employees – the Mountain View, Calif.-based social network just made your task a lot simpler. The company officially released the latest version of its Recruiter service today, adding a host of new features, based on customer feedback, that make it easier than before to sift through the network’s 400 million-plus members and find the right employee. 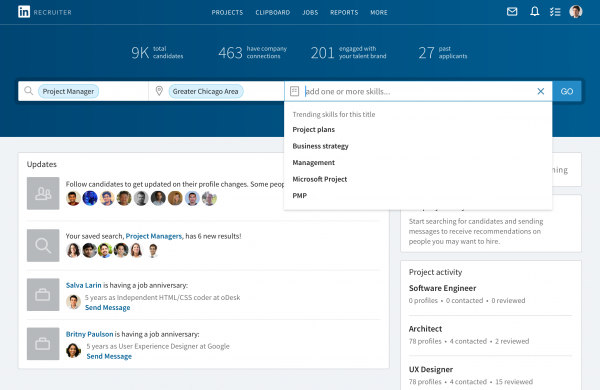 “The goal was to identify your major challenges and resolve them to enable you to find candidates faster, so you can spend more time doing what you love — hiring,” LinkedIn senior product manager Rahim Daya wrote in an April 19 blog post announcing the update. Central to the new version of Recruiter is three key additions: a simplified search bar that lists the most common advanced terms related to a user’s initial query; Spotlights, which highlights the candidates most likely to respond if contacted; and what the company calls the “find more people like” feature, which serves up a list of candidates who have the same job title and skills as your company’s top employees. As users type in terms, the Recruiter search then offers suggestions, prompting users to add a location and position if they haven’t already, before suggesting trending skills common to LinkedIn members with similar positions. Alternatively, users can simply use the “find more people like” feature by typing the name of one or more employees with a similar position from their own company, and Recruiter will not only produce a list of candidates with the same job title and skills, but display the exact keywords it used to build its list. Finally, the new Spotlight filter can be added to highlight the candidates most likely to respond if contacted based on their LinkedIn relationships, prioritizing candidates who previously applied to your company, members who are first-degree connections with your employees, or users who have engaged with your company’s brand. 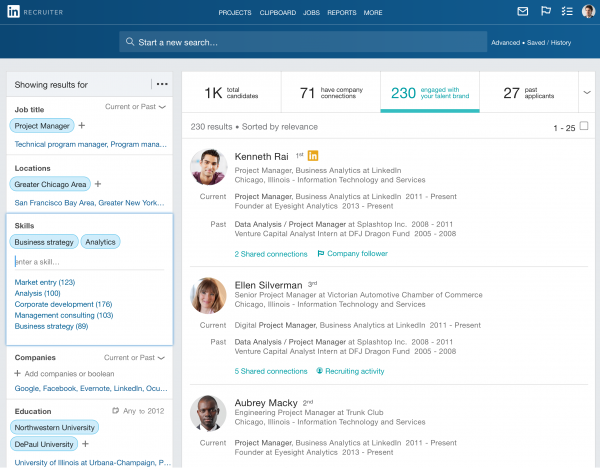 The updated version of Recruiter, which is used by some 41,000 companies worldwide, has already been released to more than 80 per cent of LinkedIn customers as a free upgrade, and can be accessed by everyone else on the service’s website.